I had a great time today! I will highly recommend you as a charter captain! Trailer was clean, boat was nice, service was top notch, Sir! Have a great weekend! Just wanted to send a sincere thanks for the effort you put in Friday to get us out there and find us some fish. I know it wasn't easy for any of us including you. It was obviously the only opportunity we were gonna have to fish this wee-end and I truly appreciate you recognizing that, and doing what you could to get us into some fish and not make the fishing part of the week-end a total wash-out. For a bunch of land-lubbers, I thought we did pretty well. Seriously, we all had a great time and I'll be calling ya again if I can scrape up the right group of people to do something like this with in the future. Many thanks for your courtesy, professionalism and for just being a damn good guy to go fishing with. That means more to me than anything. Your operation is first class and I'll be sure to share that info. with my fishing buddies. ( Got a few of 'em.) Thanks for a great ( and memorable) day of fishing. If you consider this a good review, feel free to post on your site. Not sure how that works. Have a great rest of the season and thanks again. Hope to fish with ya again soon. YOU THE MAN! God bless ya and the people ya love. Great charter. Great captains. Cleanest boats and cleanest trailers I have stayed in and have been on for any charter. Not to mention they put you on the fish. Always a great time. Jason and his captains always do their best to put you on the fish. Just wanted to drop you a line and thank you and Captain Jack for another terrific time. I fished with you once last year and twice this year. All three trips were great and we all left very satisfied. You run a class operation and I will hopefully be booking at least one more trip for next year. Great trip. Jason was an awesome Captain. Had a wonderful walleye trip. Jason I just wanted to let you know we were very happy with the Lodging and had a great time fishing with Oliver. He worked really hard to make our trip enjoyable. This was our fourth trip to Lake Erie and our first experience with Daze Off Charters, we had been out with Good Time Charlie Charters the past three years. We thought he was the best in the business, the only thing we missed going with you was smelling his pipe. Great job now its back to work so we can come next year. Have went with Jason for the last 10 plus year. We have consistently caught our limit and had great trips year after year. 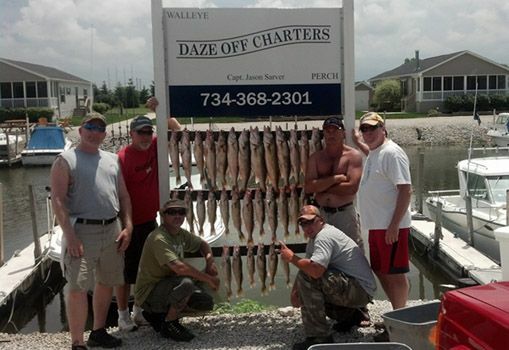 We are a professional and full-time charter fishing business. We offer premier charter service on Lake Erie and Lake Ontario with fishing for perch, walleye and salmon.